About six years ago, Ranghild Olsson Gartman planned her 50-year class reunion. Although a few classmates had died, moved out of the area or couldn't be located, more than half showed up for the festivities. ``When I met them face-to-face, at first glimpse, I didn't recognize them!,'' Gartman said. Gartman graduated from the ``old'' Cradock High School, built in 1919 at the foot of Prospect Parkway on Alden Avenue. With 37 graduates, Gartman's class was the second largest in the school's 16-year history - the class of '33 had 39 members. In June 1936, an article appeared in the Cradock News section of ``The Portsmouth Star'' detailing the school's commencement. Not a single graduate's name or accomplishment was left out of the story. It also helped that she lived within walking distance. She grew up on Farragut Street, which wasn't more than three blocks away. Gartman said it doesn't bother her too much that her alma mater is closing. Lucille Spencer Mutter will never forget the summer after her junior year. It was 1945. World War II had finally come to an end. Growing up in the '40s, Mutter said, was a delightful time in spite of the war. Mutter, who grew up on Reid Street in Cradock, was a cheerleader for three years in high school. Through the years, she and her husband, George, have been loyal Cradock fans, cheering the Admirals on at countless football and basketball games. There was one reason why Calvin Geiss played the trombone in the marching band all four years in high school. ``I took up the trombone so I could march behind the majorettes,'' Geiss kidded. Geiss, who grew up on Alden Avenue, was part of the last class to graduate from the original high school. ``Cradock was a pretty close-knit community,'' he said. ``Most people who lived in Cradock knew most everybody else who lived in Cradock, and it's just not that way anymore. ``We started in school together in the first grade and ended up graduating together in high school, so you have a closeness there. ``He calls me the `Fool of the School' '' said Wright with a laugh. Wright started as a seventh-grader at the ``new'' Cradock High School in the fall of 1954. At that time, Alf J. Mapp Junior High had not been built, so the students went from the sixth grade at James Hurst Elementary to seventh grade at the high school. Most of Wright's fondest memories of high school days involve dances. Every Friday night after the football game, all the kids headed to the VFW for ``35 Cent Stag and 50 Cent Drag'' dances, she said. Then on Saturday nights, everybody went to the Ambassador's Club to dance there. Just how long does it take to sign and number 1,500 pen and ink drawings of Cradock High School? Mike Long is in the process of finding out. ``To date, I've signed 1,105 of them, and it's taken me probably about two weeks now - not that long,'' the artist/illustrator said. About a month ago, Long was asked by Raymond Hale, Cradock's principal, to do a commemorative print of the school to distribute to the students, faculty and staff as a final souvenir. Only 1,500 of the prints were made, then the plate was destroyed. Long, who feels it's ``a real honor to be picked to do this,'' is not getting paid for his services. ``I always get a little spark from people who went to Cradock,'' said Long. Despite year after year of disappointment on the field, football season remains Tania Russell's fondest high school memory. Russell, a popular student in high school, has strong ties to Cradock. She represented her class in numerous Homecoming courts and Miss Cradock pageants and served as class president her junior and senior years. She also has two sisters who are Cradock alumni. ``The only thing I hate about the school closing is that my daughter won't be able to graduate from there,'' she said. Russell's daughter, Bianca, is 2. Phillip Williams thinks it's a shame Cradock High School is closing just as it was reaching its peak. ``Back in elementary school, when I heard about Cradock, people didn't really say anything positive about it,'' he said. ``I mean, it wasn't known for its football team or any kind of sports or even academics. ``But around my junior and senior years there, we started to branch out in different ways. We had Petey (Sessoms) on the basketball team, our Academic Challenge Team was runner-up in the city and our FBLA Parliamentary Team went fourth in the state. Williams, the class valedictorian, is a rising sophomore majoring in physics at the College of William and Mary. He credits the academics at Cradock High School for preparing him for a successful first year in college. He earned a 3.56 the first semester and was inducted into two freshman honor societies. ``I drew a lot out of high school, out of the classes, and I think I was prepared - well prepared,'' he said. ``They said the average for freshmen at William and Mary was supposed to be a 2.4, and I didn't want to get that. Barbara Lewis, the student, took 11th grade English in Room 209 at Cradock High School. Twenty-seven years later, Lewis the teacher was still in that classroom. ``I'll never forget my teacher, Ms. Boswell,'' Lewis said. ``At the beginning of the year we all hated her but by the end we recognized she was trying to hold us to a standard of excellence.' Lewis, a 1966 Cradock graduate, is one of many of the school's former students and faculty that say Cradock changed their lives. This week, she will lose the classroom and the school. On Friday, the 72-year-old school will close its doors for good as part of the city's plan to consolidate high schools. Students will be divided between Manor and I. C. Norcom High Schools. Nestled in the heart of a community created after World War I, Cradock was once in the location of the present Alf J. Mapp Junior High. The school opened in 1920 to 546 students for grades 1 through 12. It has been on George Washington Highway since 1954. It was a school created for the community and in turn loved by the community. ``The only reason I returned home was to coach at Cradock or Hampton University - both are my alma mater,'' said Jenson Baker, head football coach and 1974 Cradock graduate. ``I'm very glad to be going down with the ship,'' he said. every sport, after every victory. J. J. Booker became principal in 1949 at the school's first location on Alden Avenue and continued when the school moved to its present location. ``It was such a vibrant school,'' Booker said. ``So many students graduated with honors and proved to be assets to the community. I sure do hate to see the school close. ``When Manor High School was built I tried to prevent it because I knew Portsmouth couldn't handle five high schools,'' Booker said. Booker, known to many as ``Mr. Cradock,'' was admired by the students during his tenure, one Cradock alumnus said. Ashby said students loved the personal attention they received from Booker. ``If you won an award, you got a personal letter from Mr. Booker,'' Ashby said. Booker, now living in Wytheville, said he will always remember the cooperative attitude of the students. ``I think the whole attitude towards education was positive. We had very few discipline problems, an outstanding faculty and supportive families,'' he said. Booker served as principal until 1966, when he was succeeded by Thomas Woodrow Gray. ``I remember when I was appointed principal, Mr. Booker invited me over to meet the student body and faculty. It was very heartwarming,'' said Gray, who headed up the school until 1977. Gray, a lieutenant colonel in the Army during World War II, told the students during the assembly that he was thrilled to be at Cradock. ``I said I had worked all these years to become a full-fledged colonel and hadn't quite made it. Overnight though, they had made me an Admiral,'' Gray said. THE SCHOOL WAS SPIRITED during those years, Gray said. He said he even wore a burgundy sport coat and gold socks, Cradock's school colors, before a rival football game. ``I pulled up my pants in the assembly to show my socks and the students roared. It was that kind of give and take thing the whole time,'' said Gray, now retired and living in Portsmouth. That student involvement and pride may explain why so many Cradock graduates returned to their school as teachers and parents. ``In addition to giving me the basics for life's survival,'' Ashby said, ``Cradock gave me direction.'' He said he had always wanted to be a farmer until he came to Cradock. Baker said he had the same experience. ``Coach Charlie Wade taught me discipline and sacrifice. My biggest influence came from him. Cradock Athletic Director Marion ``Mac'' Carroll is another graduate who returned. ``My childhood dream was to come back and coach at my alma mater. I came, in 1983 and when I first walked in the hallway I had a feeling of déjà vu,'' Carroll said. Robert Jacobs, a 1965 graduate, returned to Cradock as a Parent-Teacher-Student Association member. His daughter Jennifer will go to Norcom next year. ``Being a student back then and now coming back, it's the same atmosphere, the same friendliness, the same cohesiveness,'' Jacobs said. Cradock was best known for its tradition of ringing the ship's bell after victories, but the school was full of other traditions. An Admiral appeared at all athletic functions in complete naval uniform, Ashby said. The Admiral spearheaded morale and was elected by the student body. 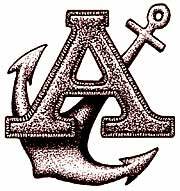 THE ``ANCHOR OF FRIENDSHIP,'' given to the school in 1979 by the Norfolk Naval Shipyard, sat at the main entrance and was always a gathering place for friends, Ashby said. He remembers when the school had ``Cradock High School Day.'' ``We would have a guest speaker and go over the history of Cradock,'' Ashby said. Cradock also had a tradition of doing community service projects, Lewis said. ``My fondest memory was working on the Thanksgiving Food Drive,'' she said. ``It gave us the awareness that even if we didn't live in the best houses, there were people less fortunate than us and we could help them. ``I hope the students stay in activities like that,'' Lewis said, ``wherever they go.